In Chinese medicine we often use a moxa stick for when we need to drive cold out of an area or to improve blood flow. Moxa is a mixture of mugwort and other herbs that are made into a charcoal stick which can be heated and lets off infrared light. Moxa is then used over acupuncture needles or points. Many of my clients have seen me use moxa in the clinic. With our animal friends you need to use caution because you are holding a charcoal hot stick and it is important to not burn our animal friends or set hair on fire. Many times I want to use moxa treatments more often than I am treating an animal and a good way to have people get a similar action is with an infrared light. These lights can be purchased in the reptile section of pet stores and are usually 50 or 75 watts or from Amazon.com. Never get a bulb over 75 watts as you can easily burn your dog or cat. I have people buy the bulbs and then put the bulb in a clamp lamp. Many people already have a clamp lamp around the house or you can buy one from home depot or the hardware store or more expensive ones at the pet store. What conditions can infrared light help with? Kidney failure in cats is the number one place I have people use infrared light therapy. I only use infrared light for ischemic kidney failure, not inflammatory kidney failure. 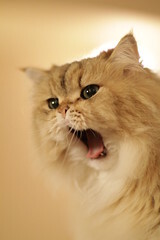 Most older cats with kidney failure have the ischemic type. 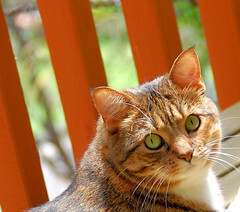 If you are unsure see Kidney Failure in Cat – How Chinese Medicine and Diet Can Help. Infrared light helps to open up blood circulation into the kidneys and wake up kidney cells that are still living but have inadequate blood flow. 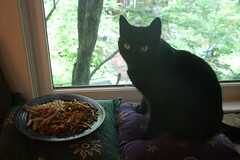 I have had cats that have reverted back to normal kidney blood work in as little as 2-3 acupuncture and heat treatments. Of course this depends on the cat and how damaged the kidneys are and how long they have been damaged. Most cats love heat therapy! Incontinence in dogs – usually with incontinence I use a combination of infrared therapy, herbs and acupuncture. 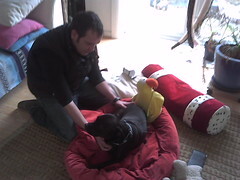 Heat therapy is however a large part of my treatments especially in young dogs. In Chinese medicine we consider incontinence in young female dogs to be cold that has gotten into the bladder during spay surgery. With acupuncture, herbs and infrared light therapy you are driving that cold out of the body. And yes it does work in about 80% of young dogs who can be gotten off western medication and live out their lives without incontinent issues. 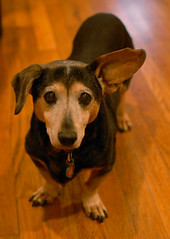 In the older dogs incontinence is considered a deficiency of kidney yang or kidney fire. Infrared therapy over the kidney yang points can help to stoke this fire and help them to hold urine. See Incontinence – stoking the blue fire sea serpent. Infrared heat can really help with arthritis support in older dogs and cats. Infrared light therapy helps improve blood circulation, drives out cold and helps with pain control. I use moxa or infrared light over any joints that are sore and often along the back. Infrared heat can also be used over the kidney points to improve energy. So how do I use infrared heat therapy? 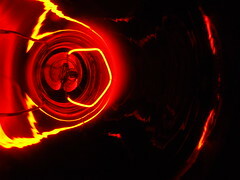 Buy a infrared light bulb, 50 or 75 watts. Once again do not use a light over 75 watts!. Use a clamp lamp from the hardware store or the pet store. Here is a link to buy an infrared bulb on Amazon.com . Clamp lamps can also be purchased through Amazon.com. I usually have people start out with using the bulb once or twice a week for 5-10 minutes at a time. You can do it daily if your dog or cat likes it. Also if they really like it you can set up a bulb a few feet above your dog or cat’s bed and let them sit under it and “self-medicate”. Never leave the bulb on when you are not home and if you animal can not walk or move do not use this option as it is important that they can move away if they get too hot. When you are using the bulb on your animal, hold the clamp lamp at least a light bulb width away from their body. Move it slowly in figure eights or hold it for 30 seconds or less at a time and then move it slightly to make sure you do not overheat an area. If the bulb is further away this is not as important. For kidney failure or incontinence you want to use the infrared light over the area of the acupuncture point ming men (aka GV4). The best way to find this point is to find the most caudal part of the last rib and then make a perpendicular line to the spine from it and follow it up to the spine. Ming men is the point in the middle of the spine that forms a right angle with the caudal point of the last rib. 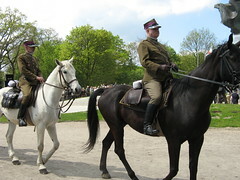 Here is a photo of a woman touching ming men in a horse, the area of her hand is where you want to focus your heat therapy. For arthritis therapy – use the same technique but work over joints and along the spine. Do not use heat therapy along the thoracic spine because there is a danger of using too much heat over the liver, which does not like to be hot. Do not worry about this if you are letting an animal “self medicate” and the bulb is up higher. I especially like the “self medicate” option for older cats who just love the heat. If your animal is prone to seizures do not use infrared heat therapy without directions from a trained veterinarian. Used in the wrong place this treatment can potentially induce seizures in an animal prone to them. If your animal has cancer do not use infrared therapy without the direct of a veterinarian. Absolutely never us it over a tumor. 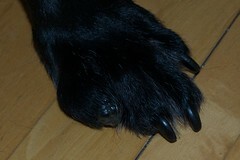 If your animal runs very hot, gets overheated easily, or has large inflammed joints check with your veterinarian. This therapy can make these conditions worse if used incorrectly. I especially like this therapy in the fall and winter when the sessions are changing and that cold wind creeps into the joints of our old cats and dogs. 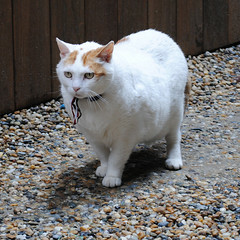 It is very common for cats and dogs who have cancer to loss weight even when they are eating well. This is because the cancer is stealing their nutrients and not allowing the body to have what it needs. Weight loss in the face of a healthy appetite and proper nutrition is called cachexia. There is a simple protocol I use to address this issue if it isn’t just an issue of appetite. Add in Cod Liver Oil or Fish Oil at 2-3X recommended dosage. I prefer the Nordic Naturals Pet Cod Liver Oil . Cancer can not use fat and Omega 3 oils help to reverse cachexia. 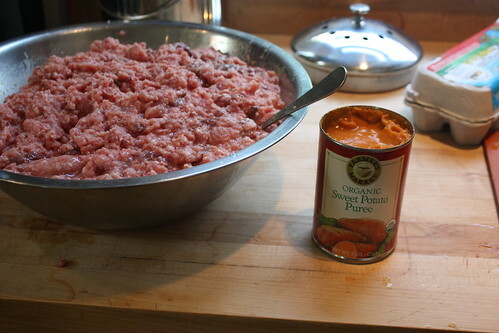 Feed 1-2 tablespoons of canned sweet potato or pumpkin at every meal for the average sized dog. Use a teaspoon for cats. This helps with digestion and helps them use the nutrients in their food better. 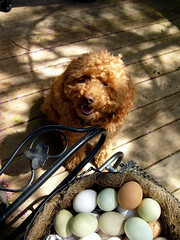 Add in 1-2 eggs a day for the average sized dog or part of an egg for cats. Eggs are a very good source of 100% digestible protein. They can grow a baby chicken from two cells to a whole animal – pretty amazing when you think about it. Cooked or raw is fine. You can hard boil a dozen at a time and keep them in the refrigerator to make it easier. Consider feeding multiple meals a day or increase the amount of food. Feed grain free food if possible. This can help and probably seems obvious but doesn’t normally work on its own without using the above additions. 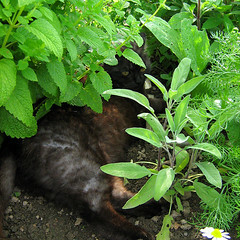 There are some other herbal formulas that can help but they differ from animal to animal, so consider seeing a veterinary herbalist if the above doesn’t work. If appetite is an issue then I recommend working with a holistic vet with acupuncture and herbs or consulting with your animal’s regular veterinarian about appetite stimulants and anti-nausea medications. The number one question I receive from people visiting this blog is “how to I find a good holistic vet to work with?” It is a good question! Ask your animal’s veterinarian From my experience there is not as large a divide between western medicine and holistic veterinary medicine in this country as there is in the human medical community. Part of the reason for this is that we are all veterinarians. I had a full western veterinary education and practiced it for six years before I learned acupuncture. I still use my western training daily. Because of this the mainstream vets trust us, they are less worried that we will do something that harms an animal or makes their treatments not work. I receive about half my patients through vet referrals. The vets that refer to me, know me, trust me and give me full access to their records and that makes it easier to coordinate treatments with them. Take a visit to your local pet food store. I’m not talking the big box stores like Petco and Petsmart but your local independent stores or small chains. In Seattle these include Next to Nature, Mud Bay, All the Best, Pet Elements, and many more. Hopefully you have one in your area. These stores are very good at educating their staff on nutrition and options for people’s animals with disease conditions. 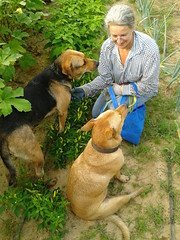 They also hear stories from people all day long about their animals. They know the local practitioners and who is good. Ask them! They are always happy to share. Ask people at the dog park or you meet walking dogs.The best referral is word of mouth. People love to share stories about their dogs and I think we just naturally want to recommend practitioners who have helped our animals. Search holistic veterinarian or veterinary acupuncturist “your city” online. The internet got you here, it should help you with this also. Use one of the tools from the various holistic veterinary societies. Nature’s Variety Find a Vet This is a list of vet who recommend their line of food. They have a good quality product that many holistic vets recommend so many vets on this list are holistic but not everyone. 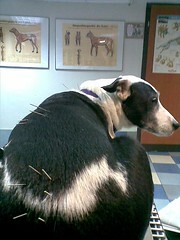 Do all holistic veterinarians know acupuncture and other kinds of natural medicine? What is the best type of holistic veterinarian for my animal? Most of us do not practice all holistic modalities, and even those with a wide area of systems they work with, usually have a few they are very good at and some that they just do a little of. I consider myself a very good acupuncturist and Chinese herbalist. I am a TCM or Traditional Chinese Medical practitioner. In addition I do some western herbal medicine, know something about supplements and vitamins, occasionally dip into homeopathy and flower essences and am pretty good at nutrition. I can not do chiropractics, do not know aryuvedic herbal medicine, and can not do classic homeopathy. Because of this if you came to see me with your animal I would most likely recommend acupuncture and Chinese herbs because those are the two modalities that work best in my hands. If you went to someone who specialized in aryuvedic herbal medicine and homeopathy they would probably recommend a therapy that included those modalities. Ever holistic vet is going to be a little different in their knowledge. What is the difference between all these methods of treatment? I am going to use mostly links to websites since there are so many good explanations already out there and then adds my own thoughts so please click on the links for more info. Naturopathic medicine – I think of most naturopaths as using a combination of dietary therapy, supplements, vitamins and western herbals to cure disease and bring about balance in the body. In Washington state human Naturopaths are on the same level as MDs and can prescribe most drugs, do blood tests and do small surgical procedure. Of course veterinary naturopaths will be western veterinary doctors already. Acupuncture There are many practitioners who practice acupuncture alone under the TCM system or practice acupuncture under a more western system. From my experience the best practitioners use TCM to diagnose and treat. Ayurvedic Herbal Medicine – This is an Indian system of treating disease and dysfunction that also includes diet. 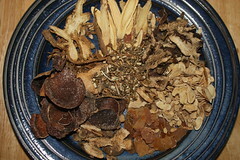 Western Herbal Medicine includes European, American, and Native American plant medicine. Traditional Chinese Herbal Medicine – see TCM above. Most Chinese herbal medicine uses herbal in combinations that work together so that the formula is not the sum of the herbals used but how the herbs react with either other. This makes it possible to use herbals that would be toxic alone by combining them with others which reduce their toxicity and also makes it possible to target herbs to a certain area of the body, among other things. Homeopathy – Classic homeopathy is a very complex system and takes many years to learn. Many of us use more of a “cookbook form” of homeopathy. Bu Zhong Yi Qi Tang is one of the formulas I take myself when I’ve been under too much stress and my adrenals are a little deficient. It has a deep root flavor with just a hint of citrus – yum! In my practice, this is the main formula I use for chemotherapy support. Bu Zhong Yi Qi Tang helps to support digestion, the immune system, blood cell counts, and adrenal function in the body and at the same time has some strong anti-cancer herbs. So what is in Bu Zhong Yi Qi Tang? In 2007 a study was done out of the University of Minnesota by K. HWa Choi DVM. This study looked at dogs being treated with chemotherapy (including doxorubicin) for lymphoma and the side effects from treatment. It was found that dogs administered BZYQT had much less diarrhea and vomiting then dogs getting just chemotherapy. They also did much better than dogs getting chemotherapy and western drugs to control vomiting and diarrhea. In addition the dogs on BZYQT had better appetites. BZYQT also significantly raised white and red blood cell counts. Overall the dogs getting chemotherapy and Bu Zhong Yi Qi Tang did much better than dogs just getting chemotherapy or those being treated with western drugs for the side effects. Not bad for an herbal therapy! 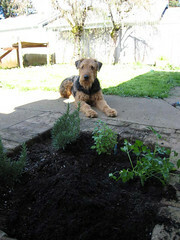 There has also been some success in the herbal veterinary community with this herbal to help manage hemangiosarcoma. Bupleurum has some amazing cancer fighting abilities. Bupleurum can induce apoptosis or cell death in cancer cells and inhibit cancer cell growth and division. Many studies have been done on this plant especially for lung cancer. Many of the herbs in this formula work in pairs. Astragulus and ginseng strongly support the immune system and have direct anti-cancer effects. Ginseng and licorice support adrenal function. Dang Gui with Huang Qi stimulates the bone marrow to increase blood cell production. Licorice and tangerine support digestion. This formula also works to increase peripheral circulation and can help to prevent some skin and nail inflammatory disorders. Many animals with deficient immune function also do well on this formula. I also often use it to support animals with deficient adrenal function (Addison’s disease). Some of its other uses are for incontinence and prolapse. In Chinese medicine terms Bu Zhong Yi Qi Tang lifts up sinking qi, supports the liver and spleen and tonifies lung qi. When do I use this formula? Any dog or cat getting chemotherapy which includes the drug doxorubicin also known as adriamycin should be on this formula. This drug is one with the most potential for side effects and Bu Zhong Yi Qi Tang can help reduce these. I also use it for dogs or cats on other chemotherapeutic agents who are having side effects or problems maintaining cell counts. In addition I will sometimes use this formula in very debilitated animals to help them gain strength and balance. I currently have one dog I treat who has a weakened immune system and is prone to getting nail bed infections that turn to cancer. He had lost three toes to this process before we found a protocol which included his formula. How is Bu Zhong Yi Qi Tang dosed? I usually dose it twice a day and use powdered whole herbs in my patients. I use 1/8 teaspoon once or twice a day for cats and small dogs, 1/4 teaspoon twice a day for dogs up to 25 lbs, and 1/2-1 teaspoon twice day for larger dogs. For tea pills use 2,4, or 8 twice a day for the above sizes of animals. If I am using a tincture I use 0.2ml per 5lb once a day. 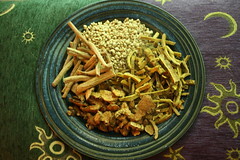 Many companies will substitute Codonopsis (Dang Shen) for ginseng (Ren Shen). If at all possible use a product that has ginseng as it is a much stonger and more powerful herb than codonopsis. You can now buy Bu Zhong Yi Qi Tang from my etsy store, Kingdom of Basil or you can buy the Yama herb capsules from Amazon.com. As with all articles on this site, please check with your animal’s vet before starting any herbal treatments. Si Miao San or Four Marvels Powder is truly one of the workhorses of Chinese medicine. It is probably the most common formula I use. You see, Si Miao San is very good at treating inflammation and our animal companions have a lot of inflammatory disorders. This is my top formula for inflammatory bowel disease, allergic dermatitis, Cushings disease, and diabetes. Please follow this link to buy Si Miao San from my etsy store Kingdom of Basil Si Miao San powder. 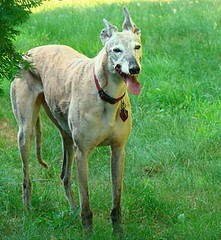 For more information on Cushings disease see my article Managing Cushings Disease in Dogs Holistically. In Chinese medicine it treats damp heat and is a simple yet powerful little formula of four ingredients. These ingredients are highly anti-inflammatory and often this formula can take the place of prednisone for inflammatory disorders but without the side effects. So how does this formula work for cancer? It’s two main ingredients, Huang Bai and Yi Yi Ren, both have anticancer actions. Huang Bai contains berberine, which has been shown in a number of studies to slow down tumor growth and induce apoptosis or cell death. If you search pub med you will find a large list of studies on berberine and its anti-cancer activities. This formula can enhance the action of chemotherapy drugs and anti-microbials in a good way. So it can safely be used with chemotherapy. However often times I focus more on the herbals that have strong immune stimulant effects for animals who are receiving chemo. The main cancer I use Si Miao San for is lymphoma and some of the leukemias. I also often use this formula if animals can not handle Hoxsey-like formula. Animals needing this formula will run hot and often times have a history of past inflammatory diseases. The Cang Zhu in this formula helps to support good digestion, which can often be a large issue in animals with cancer. While most of this formula is very cold in nature, the atractylodes is warm and makes sure this formula is well tolerated by most animals. It also does not cool them down too much. For the animals I treat I make my own Si Miao San from whole dried herbs and dose at 1/8 twice a day for cats and small dogs, ¼ teaspoon twice a day for dogs 15-25 lbs, ½ twice a day for dogs 25-50 lbs, 1 teaspoon twice a day for dogs 50-90lb and 1 ½ teaspoons twice a day for dogs greater than 90lbs. With tinctures I use .2 ml per 5 lbs of animal twice a day. 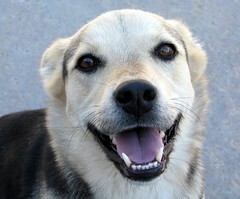 For tea pills and granules, use the human dose for dogs greater than 50lbs and dose down by weight for smaller animals. As with all supplements and herbals, please check with your animal’s regular vet before using this herbal. As gunshots rang out, he fell from his horse bleeding from where the bullet had entered his chest. As blood ran from the wound, he could feel his life slowly slipping away. Images of his small daughter and wife, who were both far away, ran through his mind. Quickly he reached for the vial, opening it to swallow the small red pill within and then taking the powder beneath it he quickly poured it in to the fresh wound. His breathing started to return to normal and he felt like he would be able to make it off the battlefield to find help. There was still some bleeding from the wound but no longer enough to take his life. Sound like something from a fantasy movie? Surprisingly it isn’t. 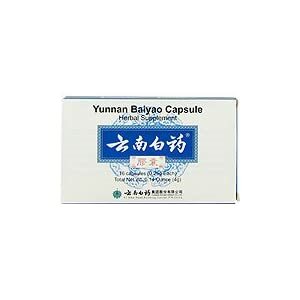 Yunnan Baiyao, also known as Yunnan Paiyao, is a special formula know to every Chinese herbalist. It was developed in 1902 in China and has been an important remedy ever since. The formula is owned by the Chinese government and the secret of what exactly is in the magic red pill is highly guarded. It is rumored that it is made from gallstones cultivated in very special cows among other things but even the workers in the factories do not know exactly what is in it. We do know that pseudoginseng is probably the most important component of it. When pseudoginseng has been studied alone it has been shown to reduce bleeding times in half. I use Yunnan Paiyao often in my patients and have been highly impressed with how well it works. 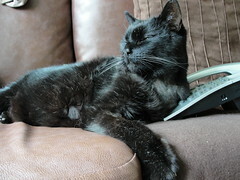 When my husband first moved in with me his cat, Sabutai, was suffering from horrible mouth cancer. One day which he was eating, the tumor in his mouth began to hemorrhage. In a matter of seconds there was blood all over the bathroom and he was just a small cat. Not knowing exactly what to do, I rushed to the medicine cabinet and grabbed one of the little red pills and pushed it down his throat. Within 60 seconds the bleeding had almost completely stopped and he did not hemorrhage again for the rest of his illness. Another time I was at the vet clinic I used to work at and saw one of my old clients in the waiting room with their older dog, Alki. They quickly explained that they had just found out that Alki had a large tumor on her spleen that was bleeding into her abdomen and that she needed emergency surgery and most likely a blood transfusion. I quickly ran home and grabbed a vial of Yunnan Baiyao and brought it back. We administered the small red pill before she went into surgery and not only did she get through the surgery well and not need a blood transfusion but the surgeon was surprised at how little bleeding there was considering what was happening. 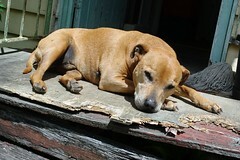 Also see Cosmo – star dog who was a wonderful dog I worked with who lived an extra year because of this herbal. So why don’t we all have a vial of Yunnan Paiyao sitting around for emergencies? I’m not sure. I know I do! And the western vets I work with do as well. In our family we often use the powder for any kind of cut or wound. It is not only good at stopping the bleeding but helps keep wounds from getting infected and is not painful to apply like many of the wound cleaning agents. It is safe and can be licked and eaten by cats and dogs without worry. But isn’t it expensive you ask? Guarded by the Chinese government and that effective! No! Usually you can buy Yunnan Baiyao for about $10 for a vial or a package of 16 pills of powder. You can even buy this on Amazon.com often. Currently it has been a little harder to find Yunnan Baiyao. I recommend The Yunnan Baiyao Store or Root and Spring. When are the best times to use it? If an animal is going into surgery, especially if there is concern about excessive bleeding, I recommend giving the powder or capsules of powder for three days before and after the surgery. The little red pill can be given right before surgery but while the animal is still awake. Dosage depends on the size of your animal (except the red pill). 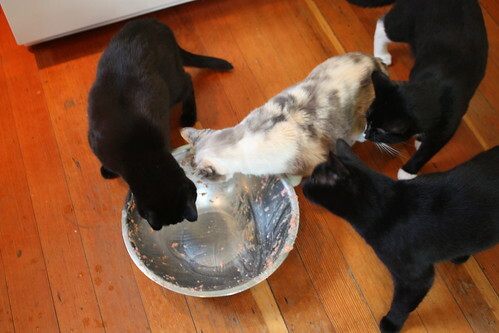 Cats usually do better with the powder mixed with a little water in a syringe because the capsules are too larger for them to swallow where dogs usually do better with the capsules unless they are very small. Nasal bleeding can be a very hard problem to control especially if there is a tumor or chronic condition which causes it. Yunnan Paiyao can be used to control nasal bleeding. Yunnan Baiyao can also be used in many of the end stage diseases where surgery is not an option but there is bleeding in the body which can not be controlled. This is a great herbal to use with hemangiosarcoma and any other bleeding cancer or tumor. The powder capsules can be used daily for this and the red pill once again only for emergency. There are also many reports of it clearing up existing infections and can be safely poured directly into wounds. Although if a wound is infected I usually reach for the antibiotics. Yunnan Paiyao can safely be used in any cut or wound although deep wounds should be evaluated to see if sutures are needed. Yunnan Paiyao will actually promote healing and help a wound to close faster. In addition pseudoginseng helps sensitive tumor cells to radiation treatments and can be used in animals with cancer that are undergoing radiation to make these therapies more effective. With Yunnan Bai Yao in most dogs I dose at one pill twice a day unless they are very large and then I double that. In cats and very small dogs the pills can be opened and half the powder can be used. In hard to medicate animals the powder can also be mixed with water and syringed into the mouth. Lymphoma is one of the fastest moving cancers out there. Because it is so fast moving, it is also the most responsive cancer to chemotherapy. The prognosis with this disease can be very bad, especially if no treatment is used. However the good news is, with chemotherapy and holistic medicine we can often get 18-24 months and occasionally ongoing remission. Integrative medicine clearly is the best way to go with this disease. With no treatment I have seen animals die within one week of diagnosis. The average is 4 weeks with no treatment. With using natural medicine, I have found usually I can move that out to 2-4 months. Chemotherapy alone pushes that even further with average survival at around a year. When a dog or cat comes to me with lymphoma, I highly recommend they consult with an oncologist or a vet who does a lot of chemotherapy work. If you want remission with this cancer you need to do chemotherapy. The most widely used chemotherapy protocol for this cancer consisted of a multiple drug approach and is given over approximately six months for dogs. In cats the protocol is shorter and the main vet I work with believes that one to three chemo treatments can significantly slow down this disease in felines. 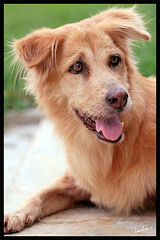 Full chemotherapy for dogs can also be quite expensive, around $4000. Shorter durations can be given for this cancer as well if cost or tolerance of chemotherapy is a concern. Because so many people choice to do chemotherapy for this cancer I divided this article into four sections. Artemisinin can reduce node size and make animals feel better. A good cancer diet without grains. If you are using chemo do not feed raw food, make sure it is cooked. 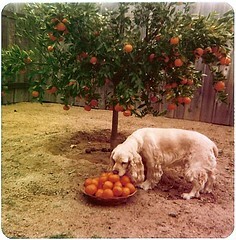 For more information on the diets I recommend seeDiets for cancer in cats and dogs. Xiao Chai Hu Tang – Sometimes I add indigo and others herbs to this formula for dogs I see in person to customize it but the straight formula works well also. If you are working with a holistic vet ask them about additions. Prednisone. Yes it is a western drug, but it will work as a chemotherapy drug and shrink the nodes. Every animal I have treated for lymphoma has been on prednisone and I highly recommend it. If you are considering chemo do not start the prednisone before consulting with an oncologist or vet who knows chemo. If given before chemo the prednisone can significantly reduce the outcome of the chemo. SanSheDan ChuanBeiYe is great at slowing this cancer down and keeping it out of the lungs. Hoxsey-like formula or Cancer Detox Support Hoxsey can make some dogs sick, I usually only recommend using it if you are working directly with a holistic vet who thinks it is appropriate. I also use a similar formula I call cancer detox which is less toxic but still has some great anti-cancer properties. Si Miao San I use a lot less of this these days but still sometimes if the lymphoma is mostly in the nodes or gastrointestinal system. Mushrooms – I give a mushroom combo with shiitake, maitaki, reishi and cordyceps There are many of these products. Mushrooms not only have effects directly against cancer but stimulate the immune system and help keep white blood cell counts up. Bu Zhong Yi Qi Tang – there is a great study out there at shows this herbal improves outcomes and reduces side effects during chemotherapy. 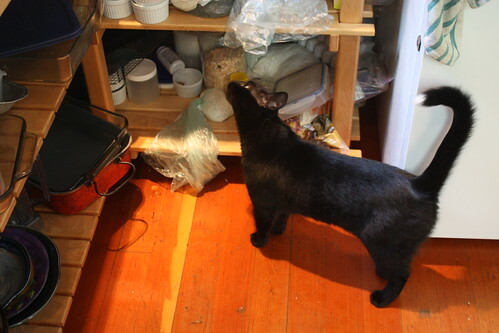 Cats have a hard time with multiple drugs and supplements. 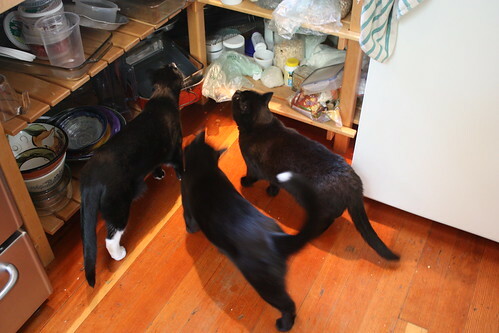 With cats I start them on my main protocol and then wait a week. If they are still eating well I will then add in one Chinese herbal formula in addition to my main protocol. How do I decide which one? The best I can tell you is usually this will either be Xiao Chai Hu Tang if this cancer is intestinal or centered in the spleen or liver, Hoxsey-like formula if the cancer is in the nodes, or Bu Zhong Yi Qi Tang if they are getting chemotherapy. If at all possible find a good holistic practitioner to work with your cat. 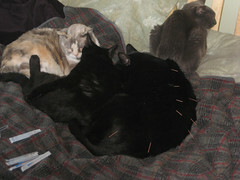 Cats generally do really well with acupuncture so if at all possible find someone who also does acupuncture. 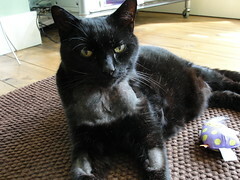 Cats can get a disease called small cell lymphoma which is very slow moving. I treat this differently and will try to put up another article on it. 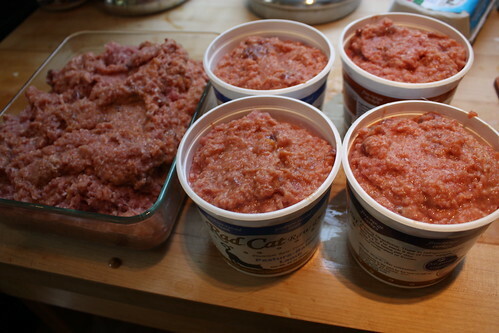 This afternoon I whipped up a batch of my homemade cat food for our four kitties. 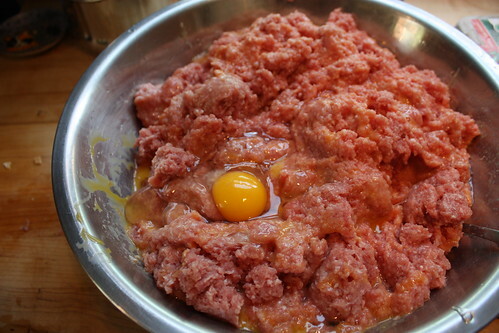 I serve it raw so it is pretty easy to throw together and a lot of fun to make. 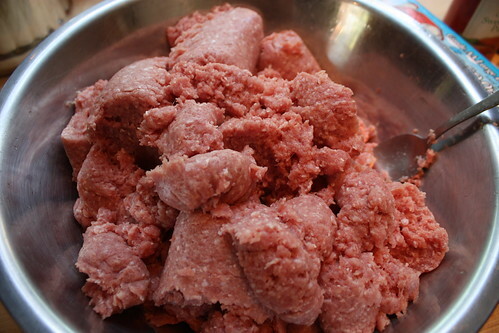 It feels like making cookies, only these kids like meat cookies and are much happier eating it as raw cookie dough. Make sure the meat has been frozen for at least 48 hours at some point. I buy my meat frozen. 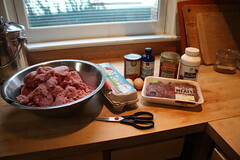 Also see Making Crazy Awesome Homemade Cat Food Part Two for a higher protein and egg free recipe. Can we have some too? All set for the freezer and fridge. This will last our kitties about a week. I freeze half of it and refrigerator the other half. The best part - licking the cookie bowl! 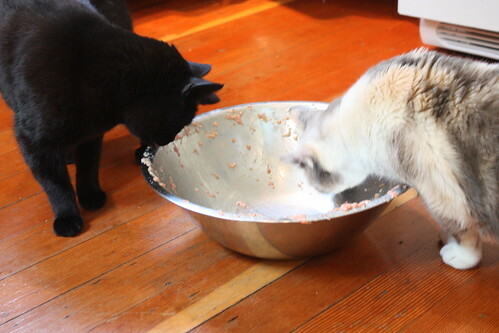 Mom, the girls are hogging the bowl!